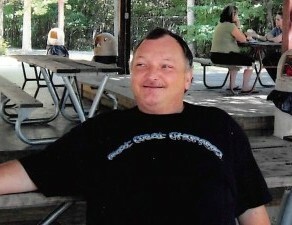 Mr. Ronald Wayne King, age 52 of Villa Rica, passed away on Friday, March 22, 2019. He was born in Villa Rica on July 17, 1966 to the late Ottis Carl King and Shelby Jean Cosby King. Besides his parents he is preceded in death by a brother Charles Crubaugh. Survivors include his wife Linda Denton King of Villa Rica; one daughter and son-in-law, Chelsea (Isaac) Goldin of Villa Rica; two sons and daughter-in-law, Timothy (Jenna) King of Villa Rica and Matthew King of Rome; four sisters and brother-in-law, Lynn Gaddis of South Carolina, Susie Cohran of Villa Rica, Dianne Kindricks of Whitesburg and Vicky (Richard) Crane of South Carolina; one brother, William King of Villa Rica; eight grandchildren, Gabriel King, Abel King, Cyrus King, Brayden Goldin, Isaac Stanley, Sean Stanley, Darren Stanley, Sebastian McCoy and several other friends and family. Funeral services will be conducted Tuesday, March 26, 2019 at 1:00 PM from Old Path Baptist Church with brother Johnny Simpson and brother Ricky Goldin officiating. A song will be rendered by Johnny Truitt. Mr. King will lie in state from 12:00 Noon until the funeral hour. Interment will follow in Piney Woods cemetery. The family will receive friends on Monday, March 25, 2019 from 6:00-8:00 PM. In lieu of flowers the family requests donations to be made to the funeral home to help with funeral expenses.